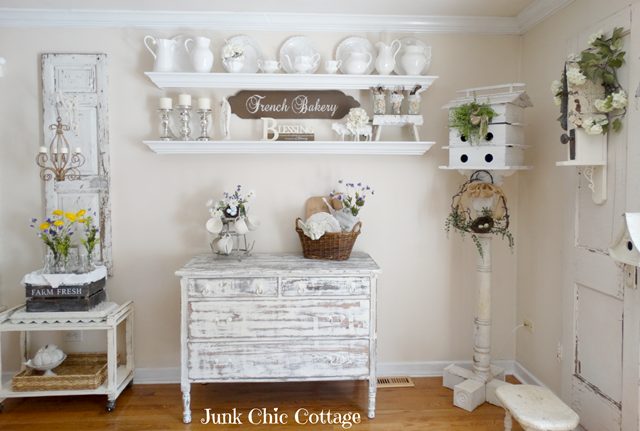 Today is a special day because I’m featuring Kris over at Junk Chic Cottage! She’s one of the first bloggers I started following and I love her white palette. Thinking it couldn’t get any better, I was then exposed to her gardens and oh my!! It was like a flower explosion over there and I was in heaven. 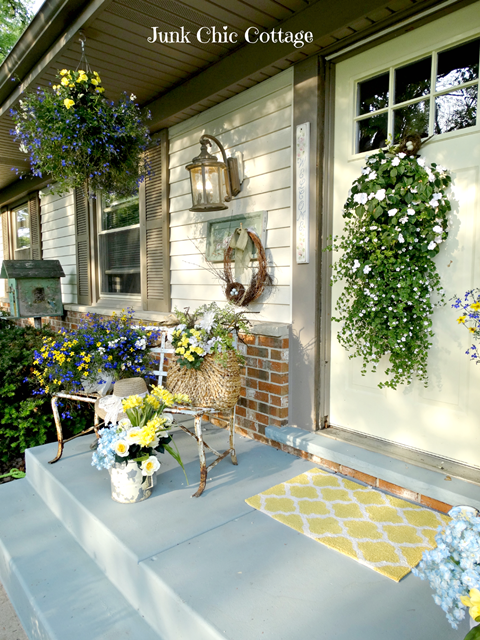 Kris’ front porch with its newly painted blue floor is welcoming and colorful. you’ll see more of her gorgeous flowers at the end of this post. 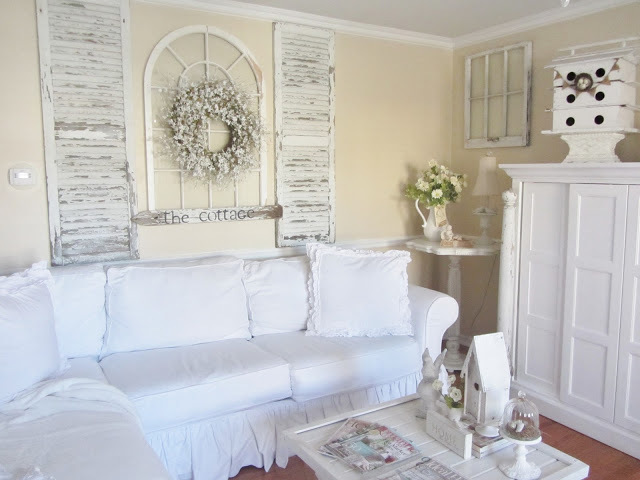 Step inside and you’ll see a sea of dreamy whites throughout Kris’ charming home. Kris adds a lot of textural elements in her rooms, which is a clever way to add depth to white rooms. Kris’ dining room is light and airy with plenty of sunshine flowing in. Ruffles on the end chairs add warmth and whimsy to this space. 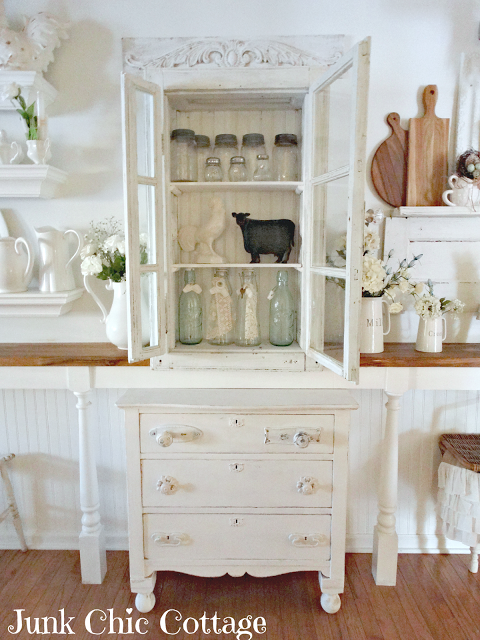 A chippy white dresser cleverly serves as a dining room sideboard. while a shutter and birdhouse create visual interest. Kris recently gave her kitchen an update. I love her use of shelves! The wood counter top and floors add warmth to this beautiful room. Pretty script fabric covers bar stool seats. I love “script” anything! I just adore this cabinet Kris created in her kitchen space. Such ingenuity! It’s both pretty and practical. Animal figurines lend a farmhouse vibe. 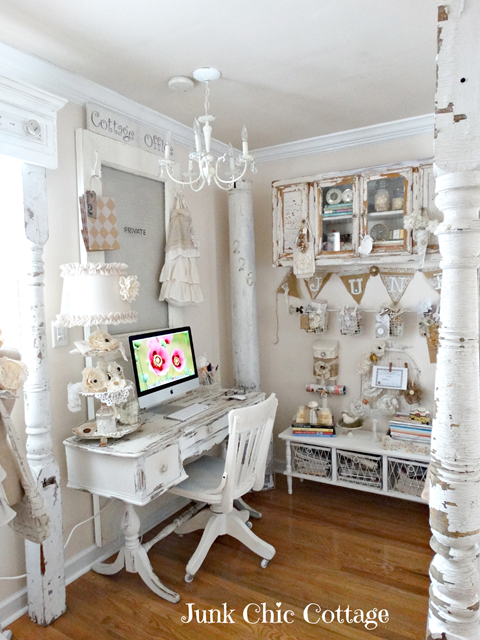 Even Kris’ office space is beautifully decorated with white and architectural elements. What a pretty place to work, don’t you think? 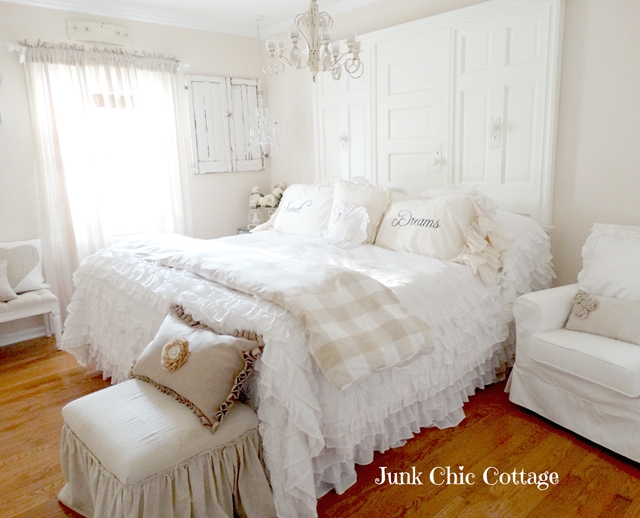 The laundry room at Junk Chic Cottage is quaint and charming with a ruffled skirt. And have you ever seen a more adorable door? 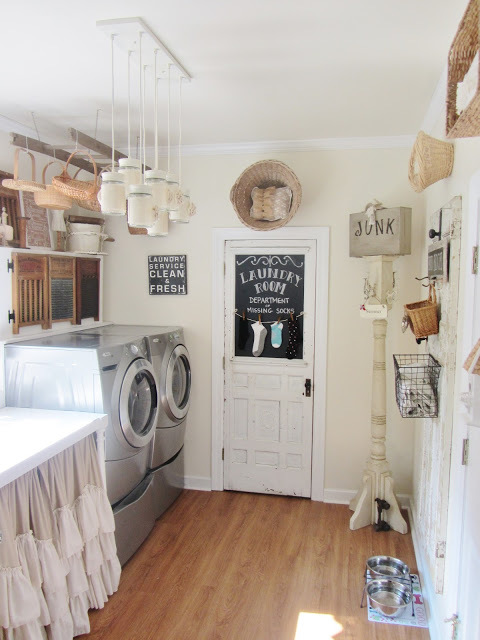 I wouldn’t mind doing laundry in a charming room like this one! More ruffles make an appearance in one of the bedrooms. The buffalo check comforter repeats the linen color in the ottoman and pillow. I can’t imagine having anything but Sweet Dreams in this room! Ah, this beautiful bed with its wrought iron gate for a headboard! The Guest Cottage sign makes it clear this is the guest bedroom. Kris added a beautifully ruffled French pillow to the space. Just lovely! Back outside, we’re greeted with an explosion of pink! 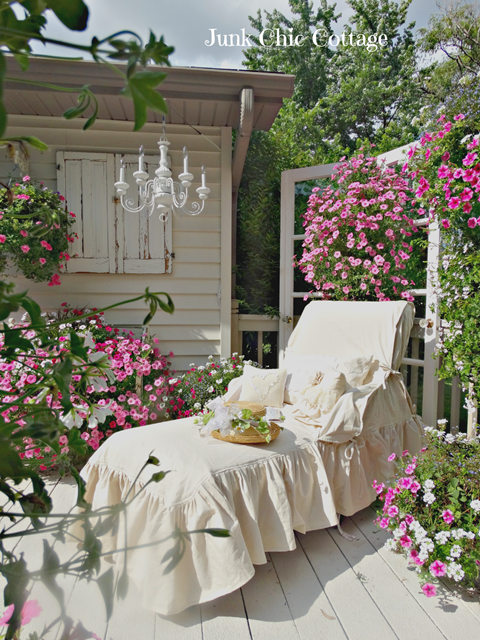 A gorgeous garden lounger slipcover adds to the romance of Kris’ garden. I don’t think I’ve seen petunias as lush and pretty as Kris’. Finally, a riot of color awaits on the corner of the deck. Again, the most amazing flowers in happy colors! … there’s so much more pretty home decor to explore! 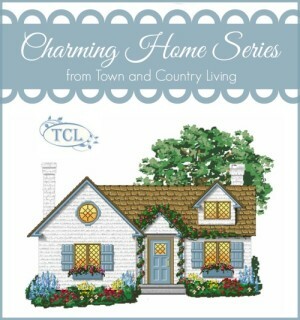 Take a tour of more houses in my Charming Home Series! Thank you Jennifer for this feature. It was really an honor when you asked to feature my home. I am thrilled to be among the beautiful homes you feature each week. Thank you so very much. your home is a clone of mine and my vision. I have a big garden too! She truly does have one of the most beautiful homes I’ve ever seen. I think hands down my favorite is her guest room — I’d love to book a few nights there! Kris has a beautiful home inside and out!! Love her style…that first photo of her front is soooooo pretty!! Luv , luv Kris and her beautifully decorated home. 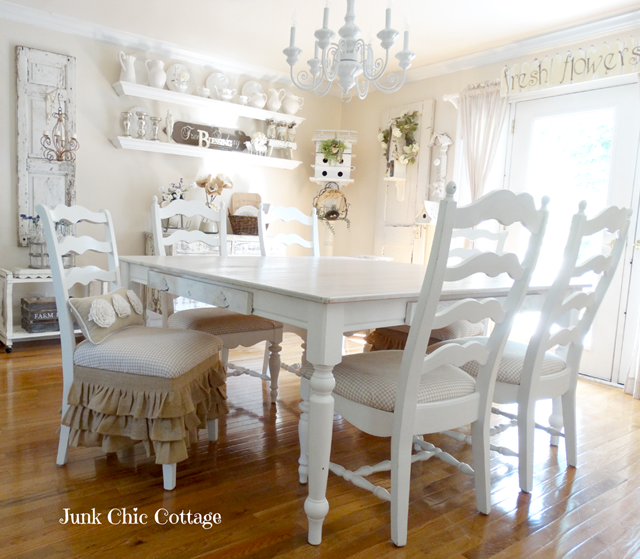 Like you said Jennifer, I saw her home on the blog and swooned! Got introduced to her gardens and fell in luv! Every square inch of Kris’ home is music to my eyes! Her sense of style and creative ideas never cease to amaze me. I could use her green thumb in my yard too! Absolutely one of my all time favorite homes. Great tour, Jennifer! What a wonderful home. No, I have not ever seen such a charming door in a laundry room. I like her idea of open shelving even in the dining room. I love the way Kris uses so many wonderful architecturals throughout her home. She is so creative and her hubby is quite handy…great combination!! I cannot say enough about the beauty and creativity of Kris’ gorgeous home…I am always amazed at what she is always creating along with her hubby to lend a hand (and a hammer, saw and nail too)….Not only are her interiors stunning, her porches and gardens are just enchanting!! !…Wonderful, wonderful feature!! Holy moly! That’s a lot of flowers! Seems like by the time I finish all the work on the yard and gardens, I haven’t much time for the potted stuff. This makes me question my choices! 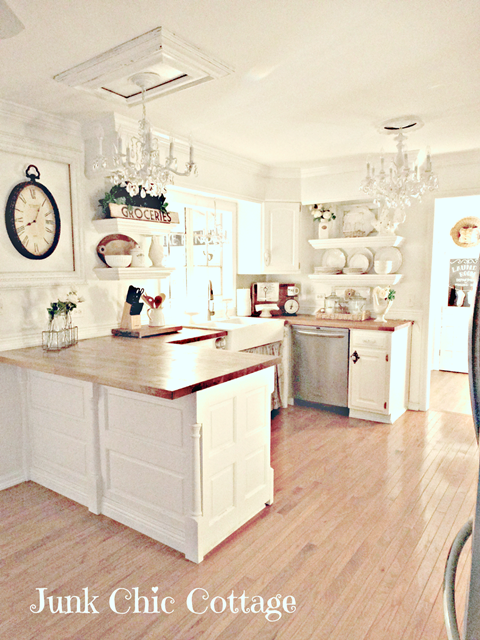 I’m crazy about Kris’ home and her style. She’s been one of my favorites since I started blogging. Nice feature! I find Kris’s home enchanting, she has a keen curator sensibility and a love of whimsy. Her style invites relaxation and is charming. kris’s home is such a beautiful place, surrounded by gorgeous gardens! tfs! Love Kris’s home! What a great tour showing all of her beautiful touches. LOVE the flowers too! I love Kris’s home! I could move right in. I think her kitchen is my favorite room. It’s always fun to see a whole house tour in one post too. Thanks for sharing it. I adore Kris! I could hang out at her house for days! And then we’d go junk shopping! Great feature! Oh my! I love all of that crisp whiteness against the chippy and well loved. So beautiful! But…that deck with it’s sudden explosion of color is totally enviable! What a beautiful home! Hi Jennifer, not sure how I missed this on Sunday. 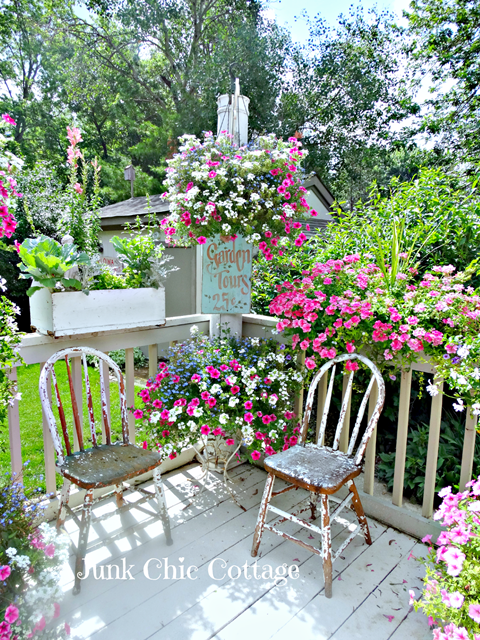 Kris’s cottage is so beautiful, I just love all the feminine touches. The kitchen is so lovely with the whites and all that sunshine streaming in. So pretty! Charming home tour. 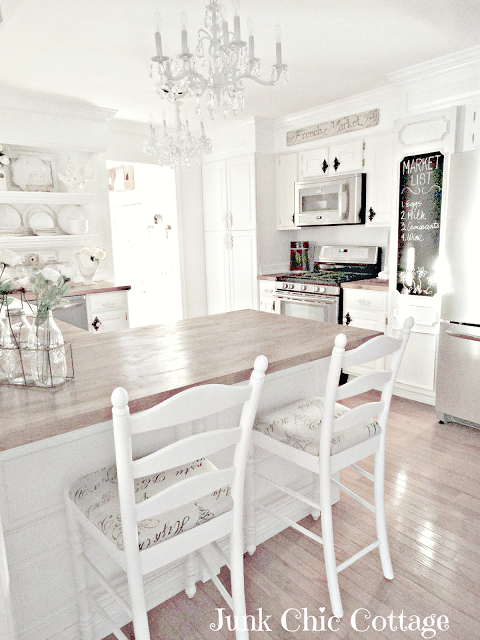 I love all of the white cottage furnishings. 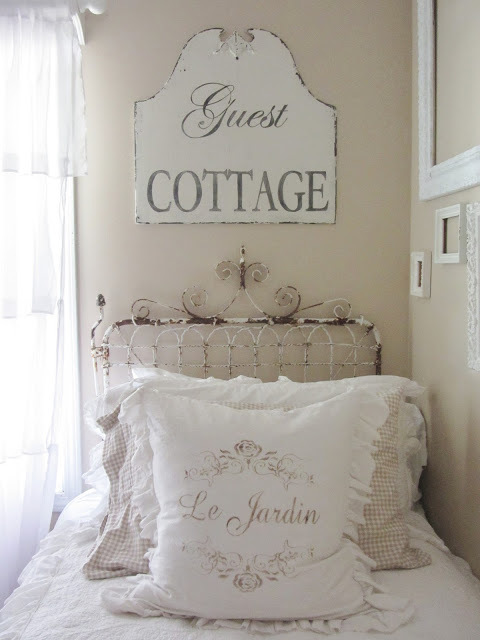 I recognize that shabby chic guest cottage sign as one we sell in our boutique found here: https://belleescape.com/large-metal-guest-cottage-sign.html. Thanks so much for sharing!